This is the thickest application coating that can be applied without using a trowel. Just mix, pour, and apply by squeegee. Outstanding performance for heaviest duty pourable epoxy product. Protects high traffic areas subject to impact of fallen items. Achieves uniform “wet look” while hiding cracks, holes and surface imperfections. Anyone can achieve professional results without experience. Premeasured 5 gal kit for easy application; Components Include: 1 gal Part A (resin), 1/2 gal Part B (hardener), 20 lbs Part C (aggregate) - volumes and weight approximate. Pour-N-Walk™ is approved for shipping to all 50 states by ground or air. Can I use Pour-N-Walk™ to fill in large voids in the floor? Yes, we have cutomers who use it for that purpose. 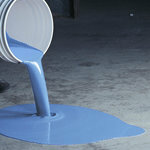 Can Pour-N-Walk™ be applied at 1/4" thick to resurface a pitted floor? Pour-N-Walk™ can be applied at 1/8" thickness in one pass using a 1/2" V-NOTCHED SQUEEGEE. You could apply multiple layers at 1/8" per layer. Can Pour-N-Walk™ be made non-slip?